Pueblo Magnet High School in Tucson impressed the Bookmans School Challenge committee with their application, video submission and site visit to earn a $15,000, no-strings attached cash award. Safford K-8 Magnet International Baccalaureate World School in Tucson and Dobson High School in Mesa also won big, receiving $3,000 each for their deserving projects. That’s a total of $21,000 from Bookmans to Publicly-Funded Arizona Schools as part of the School Challenge. 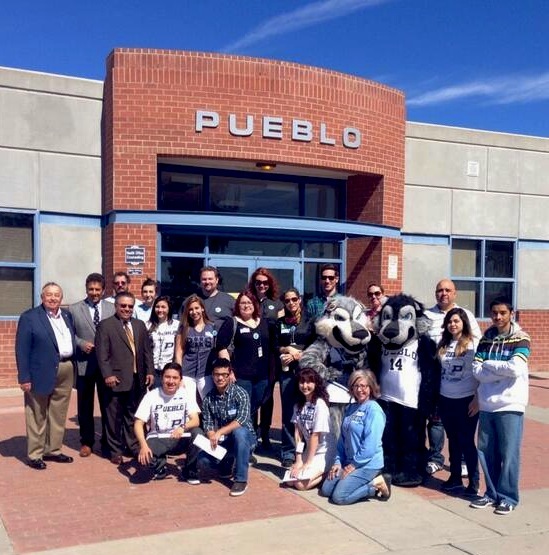 Pueblo High School welcomes the Bookmans School Challenge team. Photo via @WarriorNewz Twitter feed. The historied community at Pueblo won over the Bookmans team with a strong Sí, se puede! attitude. This “can do” spirit permeates academic, extra-curricular and social environments. “The responsibility students, educators and alumni feel for one another creates probably the strongest sense of community we’ve seen in the Bookmans School Challenge,” says Bookmans Marketing Director Sheila Kressler-Crowley. Pueblo High School plans to spend the $15,000 they receive from the Bookmans School Challenge to create a cyber cafe for students to further strengthen ties to each other and extend their reach to the world. Safford wowed the Bookmans team with strong partners like the Children’s Museum and the Community Food Bank. Students at Safford gave a tour of their historic building, displaying mastery of their lessons and culminating in a celebration and performance by the school’s jazz band. Safford is a welcoming school with rigorous academics that maintains a joyful vibe. Safford has big plans to build an outdoor space for students to learn and play with their $3,000. Dobson Pride filled the halls of the school during the Bookmans visit. Students in every corner of the school wore blue in support of the Mustangs. In recent years, educators and students at Dobson decided they didn’t want to settle for good enough. Participation in all areas has increased dramatically and student support across groups makes anything seem possible at Dobson. A team of students, educators and staff will determine how the school spends their $3,000. Pueblo, Safford and Dobson competed with other state-funded elementary, middle and high schools across Arizona for the Bookmans School Challenge. Bookmans honors all the schools in Arizona who go above and beyond, often on their own time and dime, for their exceptional students. Bookmans hopes to continue to hear from all the schools who participated in the School Challenge and to encourage conversations around what Arizona schools are doing to inspire students. For more information on the School Challenge and other Bookmans programs that support students and educators, visit http://bookmans.com/about/programs.